Ecliptic Sight was born out of a simple idea, as most things are to only give information of things that are good. Ecliptic Sight Podcast: The End? Edition was engineered to forecast the impending hiatus. Saibot and DJ headpiece747 team up and join forces to deliver the best possible show as if it was their last. Half vinyl, half digital, and half drunk this will be the crowning achievement with a couple of nice surprises at the end. Disclaimer: Saibot and Ecliptic Sight Podcast are not associated with any artists or music played unless noted. All rights are reserved to the individual artist or artists. Support any songs or artists that you hear by picking up their album. Tracklisting at EclipticSight.com. Ecliptic Sight Podcast: Random Edition is for those days when you can lose it all in a blink of an eye. What happens next is what defines us. Do we accept defeat or keep it moving? Ecliptic Sight Podcast: Future Edition is a extragalactic of definitive mass portions of lyrical goodness. It also has music, emcees and apes. Ecliptic Sight Podcast: Jolly Blend Edition is an extra choice holiday instrumental mix by all-embracing DJ headpiece747. So I asked him what does he remember about holidays? His answer: Christmas, Cartoons, and Hip-Hop! With a cup of spiked eggnog in his hand, he has a devious plan to chop all three genres into one cohesive blend. Back to his old ways, there is no tracklisting available because DJ headpiece747 is too buzzed to remember. More info at EclipticSight.com. 1. Slang. slightly drunk; tipsy. Ecliptic Sight Podcast: One Dollar Edition is a mix by intercontinental DJ headpiece747 with albums that he acquired from the pass HipHopSite.com $1 dollar sale. This is something of a first for DJ headpiece747 because he not only gives us a tracklist, this mix has vocals on every song and he did it all sober?! Is this a new frightful beginning for him or will he continue to deliver the drunk instrumental sets we have all come to love? I guess we will have to wait and see. Ecliptic Sight Podcast: Disturbing Edition was genetically created to scare the living and open their minds to discover independent music. In other words this is music that you can sit in the dark and enhance your ecliptic mood. Ecliptic Sight Podcast: Hammered Blend Edition is another special instrumental mix by world-class DJ headpiece747. Eight years later he is at it again and intoxicated as well. 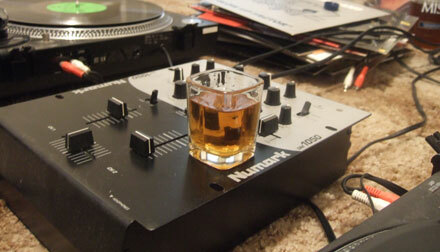 How does he blend the records with one hand on the turntable and the second one on a bottle of vodka? It is truly a remarkable thing to witness. As always there is no tracklisting available because DJ headpiece747 is too drunk to remember. More info at EclipticSight.com.